We’ve come across a new fashion this year. 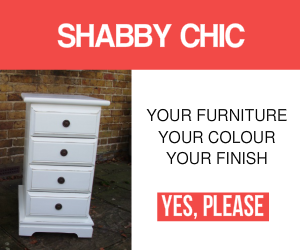 The fashion for two-tone shabby-chic painted furniture. And it’s a distinct trend right now. It typically involves the top working surface of a piece of furniture being left raw, without paint. With the rest of the piece of furniture painted and “shabbied” as normal. To date we’ve left some top surfaces bare wood, we’ve waxed others and also applied a polyurethane finish to other shabby chic treatments. Desks, tables, sideboards, chairs and bookcases all look good with this two-tone shabby-chic painted look. Is the trend still growing? We reckon so. Certainly there seems little respite right now. We suspect that some major furniture retailers must have this look right now in their catalogues and showrooms. And they are certainly promoting the over all look for our homes. This dresser was originally manufactured in the UK to a very high specification. And after twenty years or so its owners wanted a change…looking to make their furniture blend with newer interior decor and furnishings. The choice of paint? 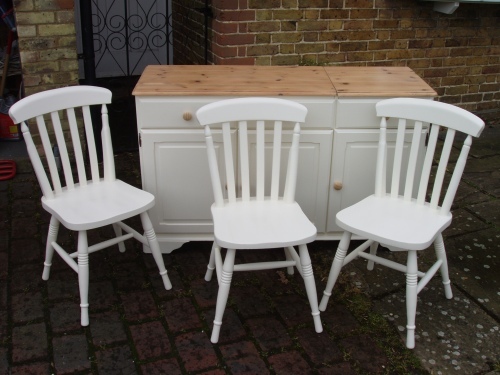 Farrow and Ball Joa’s White, which was one of the top shabby chic paint choices in 2013. It proved a fiddly piece of painting. But the results speak for themselves. So, an over all very good project to work on. This two-tone shabby-chic painted treatment is a simple and effective way to get the look with your existing furniture; making good with what you’ve already got. And that’s got to be the true spirit of up-cycling. 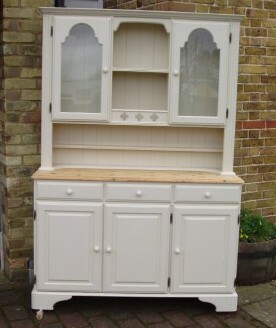 When you have a similar piece of furniture that you would like to be painted, then please don’t hesitate to get in touch. Because we can always discuss your choices of paint, paint colour or paint finish.